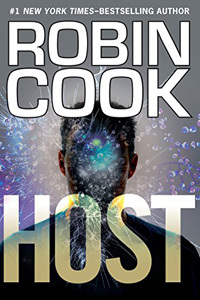 Host by Robin Cook: Synopsis and Online Purchase Options. Synopsis (from the publisher): Lynn Peirce, a fourth-year medical student at South Carolina's Mason-Dixon University, thinks she has her life figured out. But when her otherwise healthy boyfriend, Carl, enters the hospital for routine surgery, her neatly ordered life is thrown into total chaos. Carl fails to return to consciousness after the procedure, and an MRI confirms brain death. Devastated by Carl's condition, Lynn searches for answers. Convinced there's more to the story than what the authorities are willing to reveal, Lynn uses all her resources at Mason-Dixon — including her initially reluctant lab partner, Michael Pender — to hunt down evidence of medical error or malpractice. When Lynn and Michael begin to receive death threats, they know they're into something bigger than either of them anticipated. They soon enter a desperate race against time for answers before shadowy forces behind Middleton Healthcare and their partner, Sidereal Pharmaceuticals, can put a stop to their efforts once and for all.